Kangertech EMOW Battery - 1300mAh, the same battery as the one in EMOW kit. A good choice to work with you ego/510 cartomizers/ atomizers. Now available as a spare part! 5 colors available! Kangertech EMOW Battery 1300mAh, the same battery as the one in EMOW kit. Voltage can be adjusted via pressing the button! A good choice to work with you ego/510 cartomizers/atomizers. How to turn on the battery? • The EMOW battery comes with 5-click protection: Generally, the battery is shipped in the off position. In off position, the battery will not function even when pressing the button. To turn on battery, press manual button 5 times within 2 seconds. You will see colorful LED blink 3 times. To turn off battery, press manual button 5 times within 2 second as well, the colorful LED will also blink 3 times! "5-click protection" can protect the battery from being activated when you do not want or do not use it. No more firing in your pocket! • With a unique design, you can adjust the battery's output voltage by pressing the button 3 times in one second while the LED light will blink 3 times. 3.7V(Red light), 4.2V(Green light), 4.8V(White light). • When the battery power is low, the battery LED flashes 15 times continuously while pressing the button, pls get the battery charged immediately. • To charge the battery, pls gently screw the battery into the USB charger. Plug the USB charger into the USB port of an AC-USB charger or a computer. It takes about 4 hours to fully charge the battery. • You should use only the dedicated USB charger for the battery. • Pls Fully charge the battery before using to maintain a good battery life span. • The battery comes with 510/eGo thread, it can work with 510/eGo thread cartomizers. • It can only work with atomizer/cartomizer with a resistance between 1.5ohm~3.3ohm. • There is CE mark on the e-cig body. The order was less than a month, the battery is very well packed, the first time ordered here. Very satisfied, came charged, i already soar the second day, i think soon will sit down, soar wonderful, believe me i ordered a lot. the seller is beautiful, thank you! Charging is not included, so order separately, i have. recommend! 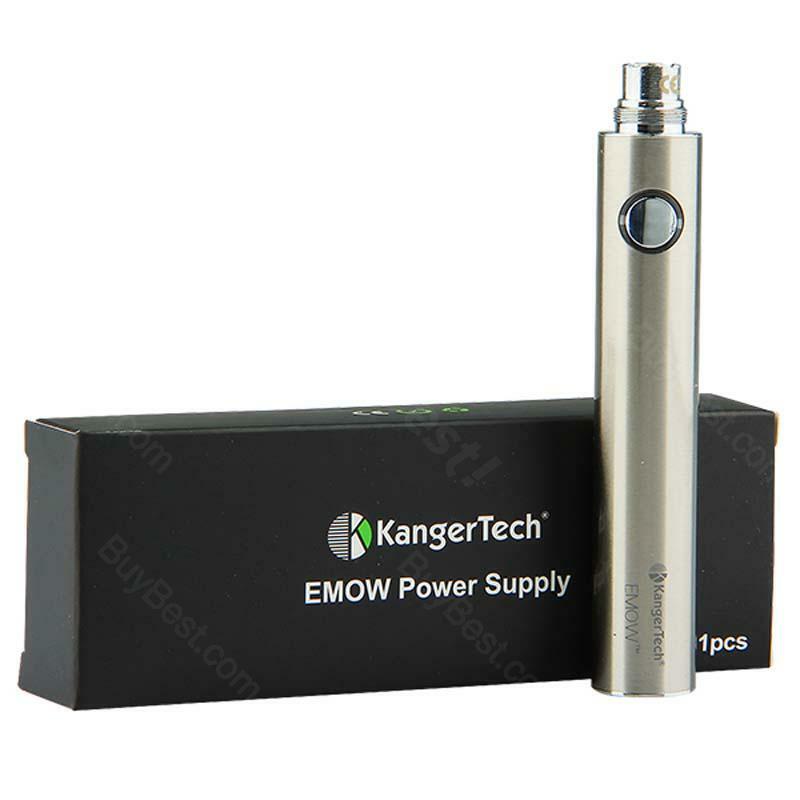 Kangertech EMOW Battery is a 1300mAh capacity battery with an adjustable voltage and a short circuit protection. It has two modes to decide which output is desirable. It has a USB port. It is available in black and silver. this is the best battery i have owned thus far. formerly, i used the Kanger evod VV twist (i owned six of them) but have happily switched to this battery after the VVs would no longer hold their charge. i did receive one defective battery, but AWESOME Vapor Authority replaced it for me with absolutely no hassle. highly recommend Vapor Authority AND this battery.